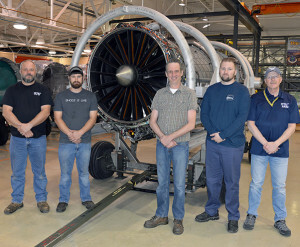 From left: Marcus Moore, Korey Blundy, Warren Flick, Dustin Troutman and Rick Emlet stand in front of a Pratt and Whitney F135 turbofan engine used in all variants of the F-35 Lightning II April 25, 2018, at Hill Air Force Base, Utah. A little known shop within the 309th Aircraft Maintenance Group at Hill Air Force Base, Utah, is the 576th Aircraft Maintenance Squadron’s Engine Shop. The shop is surprisingly small considering the 40-plus F-16, F-22, F-35, and A-10 engines stacked side-by-side in the building. The 12 propulsion technicians who work in this small area manage to perform organizational level maintenance on more than 200 engines per year. The shop’s maintenance tasks include engine inspections, external engine component removal and replacement, repairs, and troubleshooting during flight line and test cell operations. During the second week of April, damage was discovered to the mount of the front frame skate assembly of a depot F-35 Lightning II engine, requiring an F135 engine fan module replacement. Normally the owning unit would ship a replacement engine at the cost of around $6,000. In addition, return of the damaged engine to Pratt and Whitney’s Florida overhaul facility would require an additional $6,000. However, due to the production schedule of the Department of Defense’s newest fighter, receipt of a new engine would take over two-weeks and add extensive costs to the Pratt and Whitney engine program. To save valuable resources and safeguard the Ogden Air Logistics Complex delivery schedule, a Pratt and Whitney program manager sent a request to the 576th AMXS Engine Shop supervisor to have its recently certified mechanics perform the fan module replacement. 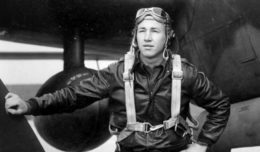 Although the task had been accomplished by active-duty and reserve members in the 388th and 419th Fighter Wings, an intermediate repair task of this magnitude had not been seen in the Ogden ALC for more than 25 years until April 13, when four members of the 576th AMXS Engine Shop began what would become a major milestone for the depot. The team reached out to the 388th and 419th Fighter Wings for special tools, fixtures, equipment, and facilities essential to complete the in-depth repair. In three days, the team had accomplished this highly complex task, leaving their peers marveling at their success, according to Ogden ALC officials. The technician’s accomplishment of this milestone proved the shop’s ability to support the Ogden ALC’s emerging F-35 engine workload and their ability to support the Department of Defense’s newest fifth-generation fighter for every F-35 unit around the globe.